John Moe is from Seattle and as such is a huge fan of just about all of their sports teams. John has been featured in several humor anthologies and he has been featured in The New York Times Magazine. 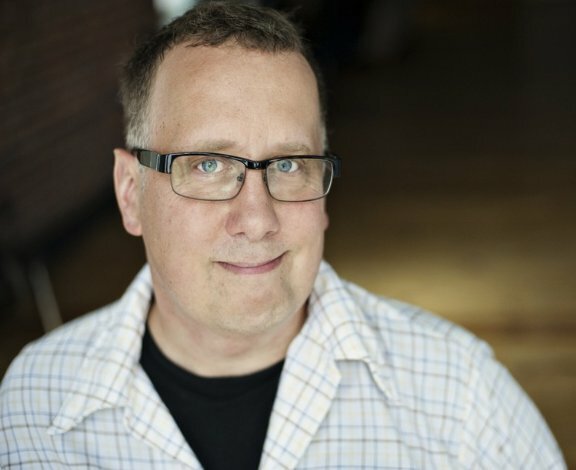 John also has a vast amount of experience with public radio , he’s the former host of Weekend America and is currently the head writer for Wits. John can be found on Twitter, Facebook, and on Wits website. “We all know how Darth Vader shared his big secret with Luke Skywalker, but what if he had delivered the news in a handwritten note instead? And what if someone found that letter, as well as all of the drafts that landed in the Dark Lord’s trash can? In the riotously funny collection Dear Luke, We Need to Talk. 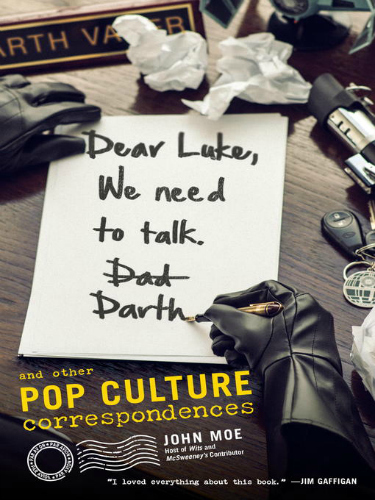 Darth, John Moe finally reveals these lost notes alongside all the imagined letters, e-mails, text messages, and other correspondences your favorite pop culture icons never meant for you to see. When I read the title of this book I was super excited, I loved the thought of seeing these shows and movies that we all love from a different perspective. When I opened it up and started reading it I was not disappointed, I read EVERY story that was in the book including the ones that were about shows that I had never watched. While I didn’t completely understand those stories they still brought a smile to my face. “Concerning Bon Jovi, Wanted Dead or Alive” was by far my favorite of the stories as it was told as as a police memo from H. Locklear, LOVE it. Other stories range from the shark from Jaws trying to go vegetarian and keeping a diary about it to the complete rules of Fight club. Every story is just as funny as the one before it and everyone should be able to find a story they love in this book. If this sounds like something you’d like head over to purchase by clicking here. Great post! This book looks interesting! This book is RIGHT up my alley! I need to get my hands on a copy! This seems like a book I’d enjoy! To the bookstore I go! Sounds like a great read! I will have to check it out sometime. That does sound like an interesting book. And Mr. Moe has been very happy with NFL if he’s a fan of Seattle’s team, eh? 🙂 Good for him. Thank-you for this great summer read suggestion! I need a book now that I finished OITNB! This looks like it would be so awesome. I’m going to check to see if there’s a Kindle version. I think it’s something my husband and I would both enjoy! I think my husband would love this just for the cover and title alone. He is obsessed with all things Star Wars. I’m not a huge Star Wars fan but I bet my husband would get a kick out of this book! The cover totally won me over. I know they say not to judge a book by it’s cover, but I love this cover and would totally read it. Thanks for sharing about it. What a cool concept for a book. I might have to get this for my hubby! That sounds like a book i could really get in to.Thank you for sharing. Such an interesting idea for a book! This is one I would definitely pick up. This looks awesome! It would definitely be something my husband and I would enjoy sharing. I’m such a Str Wars ned. This book is right up my alley! Sounds like a good book. Thanks for the recommendation. This sounds like a perfect summer read. I need to plan more time to read! I’m a pop culture junkie, so I would LOVE to read this! Movies are my thing! I NEED to read this! I know I will love it! This looks great…and super funny!! I love books like this. Original, but yet pulling on pop culture as well. Sounds like a great read! Neat book! I’m looking for one to read, I’ll have to check this out! This sounds like a silly and funny book to check out. I like the idea of written correspondence for these interactions! I agree – this book is definitely something I would love! Thanks for sharing this review! This sounds like a real fun book. I will have to look into this one. The cover alone got my interest. This book is right up my alley. Thanks! How cool. I would love to read this book. The cover is so cute. This sounds like a neat premise for a book. I would give this a read. This book sounds fun! Great for my summer reading list! This sounds like an interesting read. Thanks for sharing your review! I love it when people make up their own alternative endings or re-write a story. This book sounds like a load of fun! Oh wow! I bet this is a great read!! I’ll have to pick up a copy. Oh I HAVE TO show my hubby this – he would LOVE this read!! Thanks for sharing! This looks hilarious! Sounds like a good read. Looks like a great summer read! Thanks for the review you looks like you enjoyed it!